I opened the pages of Amazing Spider-Man #698 with a little bit of trepidation. While I know the general assumption is that at some point, some semblance of a status quo will return to Peter Parker’s universe and any hysteria espoused by me and others about imminent changes is probably premature, if I take Marvel at its word, this comic is the first installment of the final story arc in one of my favorite comic book series of all-time – the one which I’ve centered my entire hobby around. Does that mean I didn’t want to read this comic? No. I was already well aware that there was a major “twist” ending and considering some of the clues being dropped in interviews, I had an inkling that the outcome we got on the final pages of this issue was the ending we were going to get (to some degree). 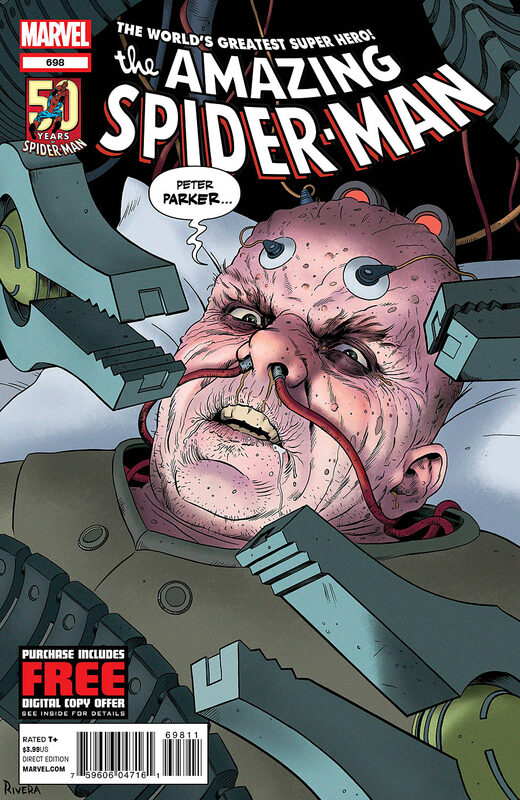 But if I can take a moment to be a little melodramatic, I still can’t believe that this is (allegedly) the final arc in Amazing Spider-Man history – a title that I thought would live on well past my time on this planet. Everything around the world changes so much, you’d think something steeped in so much tradition and legacy would be immune. Then again, I’m sure I was saying the same thing in 1999 when they issued “volume II” of ASM and renumbered at #1 (only to go back to the old numbering in the lead up to #500). In other words, what do I know, and never trust anything in the comic book world. With all that said, if we are indeed setting up for a “finale,” I will at least admit that Marvel and Dan Slott are going about it the right way – or at least involving the right people. A long-standing debate about Spidey fans has always centered on who exactly is his arch-nemesis. 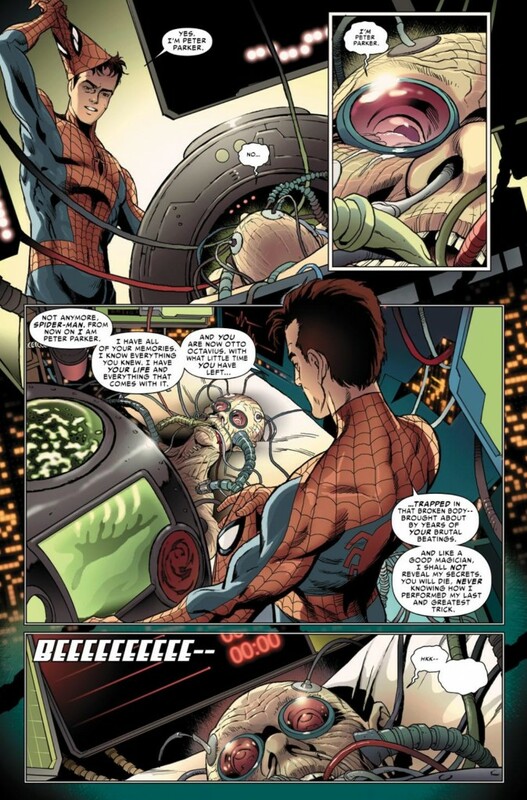 The debate usually comes down to Doctor Octopus and Green Goblin/Norman Osborn. 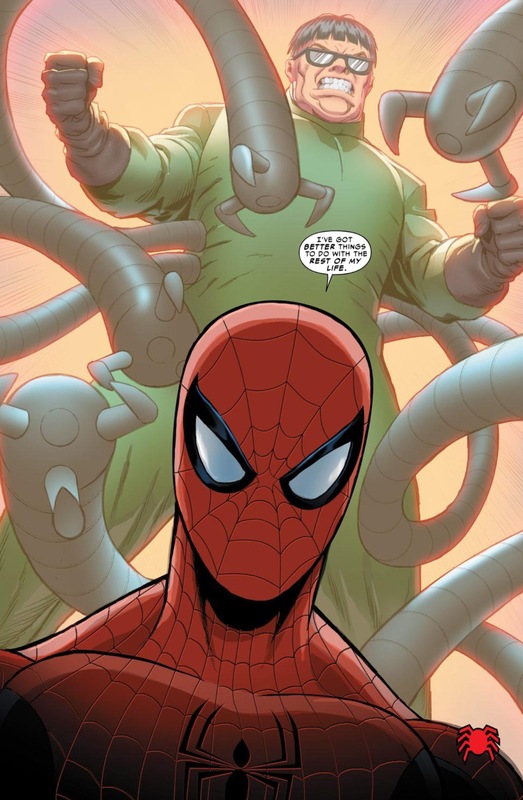 Doc Ock has long felt like the perfect foil to Spider-Man, even sharing a number of physical (eight arms) and intellectual characteristics. But somewhere along the way, there was a decision to link Goblin to some of the more heinous acts committed against Spider-Man and his loved ones. And even years after he was allegedly killed, Osborn came back to torture Peter in the 1990s during the awful Clone Saga (also undoing some very heartfelt things from ASM #400 involving Aunt May). 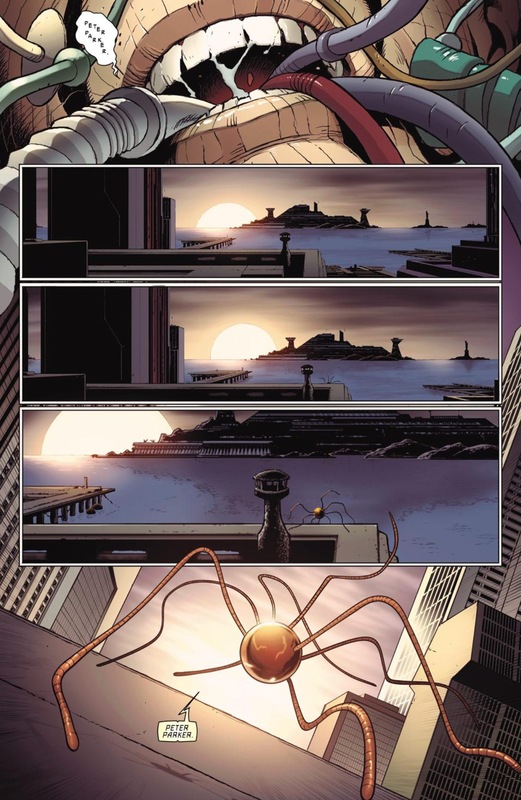 Though Doc Ock and Goblin are both classic, legacy villains, it just feels right that in his final, desperate act of vengeance, Otto may have finally found a way ruin Peter’s life forever by switching bodies with him (or minds, maybe. There’s an imaginary science here, and I’m sure I’m not explaining it right). There’s a history there, and this issue makes you consider it. 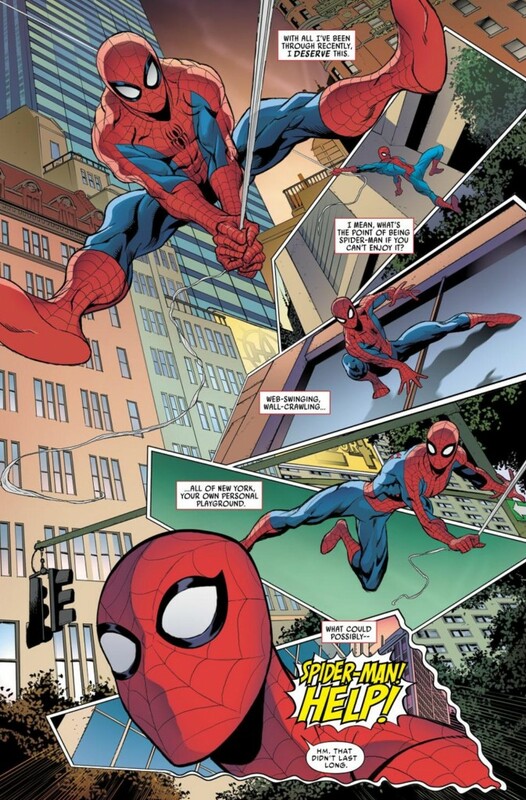 What makes this issue’s final “twist” so effective is the fact that the comic generally reads like your standard “day in the life” Spidey comic, something akin to a bottle episode of a television show, and yet once you know the outcome and re-read a lot of the panels, you can tell that there’s just something off in the way Peter/Spidey is interacting with people. There’s a measure of arrogance in how he talks to the folks at Horizon Labs, and of course his affections for Aunt May do come across a little odd if you think it’s actually Peter saying these things and not Otto. When you create a comic book that you actually have to re-read to get all of the meaning out of it, I think it’s an incredible accomplishment. So now we have an interesting character study to consider. The Amazing Spider-Man is a story of a cocky scientifically-gifted wallflower who, despite gaining incredible power through a radioactive spider bite, is forced into a life of do-gooding because of his own irresponsibility leading to the death of his Uncle Ben. I know Kaine is promoted as “all of the power, none of the responsibility,” but he doesn’t share the longevity or scientific aptitude of Otto. 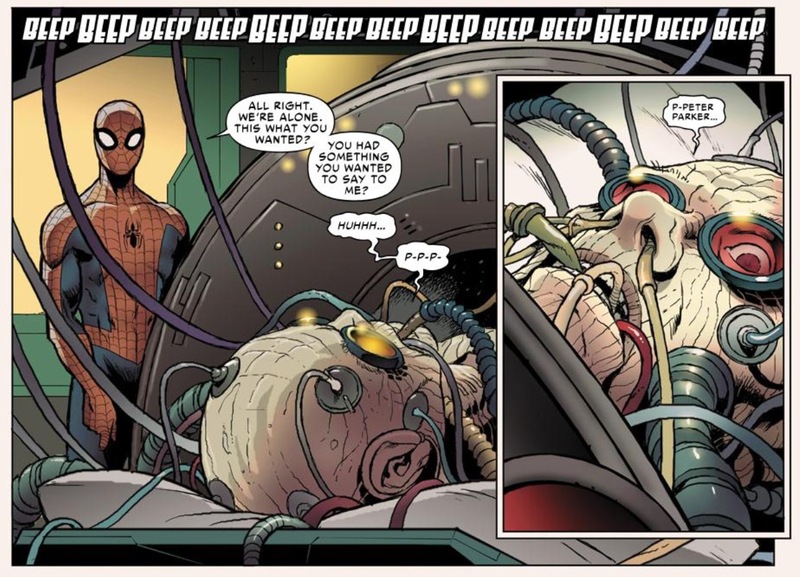 Doc Ock as Spider-Man will truly be a story of how Spidey would have progressed if Uncle Ben didn’t die. 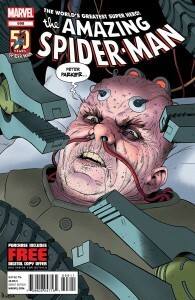 Or more simply, what would happen is Spider-Man broke bad. With that said, I don’t know if Otto acting out as a newer “edgier” Spider-Man is a storyline that can carry its own title for more than a few months. Yet Marvel NOW seems insistent all the same on changing up the characters and themes of many of its core titles, so I’m sure somebody I have doubts and questions about is going to be under the mask when Superior Spider-Man debuts next month.